Out of curiosity, how much of the work you do outside class gets done in the morning, in the afternoon after school, in the evening, at night? Today was the first time I left school fully prepared for the next day in weeks. I try to do things in the afternoon while I’m still at school but I’m just so beat, it doesn’t happen. I’ll usually get a little done at night, but I get the bulk of my work done in the morning. I’d rather wake up an hour early and be very productive than try to slog through something in the afternoon when I’m tired (and it’ll probably take twice as long because I can’t focus). And yeah, maybe there’s a little of that old procrastinator in me, but I think I just like the mornings. Heaven knows if I didn’t being a teacher would be even harder than it is. It was only important to me that the students experience a hand which they absolutely should fold, a hand which a sane person would only hold onto if he could see his opponent’s cards. If I’ve had one problem with this lesson in the past few years, it’s that, well…teenagers are not sane. Today I had a total of 6 boys (and it’s always boys) who would definitely bet on that last hand, even though everyone else agreed they shouldn’t. I even changed the hand to make it one pair, and still they would bet. Maybe I should make it high card only when I try it next time. I’m not sure if even then that will deter them. I just submitted my application to be a Math for America Master Teacher. For the personal statement, it asks me to write about how I am continuing to grow into the mathematics teacher I want to be. Of course, my main answer was #MTBoS, because, well, we else am I going to experience so much great math teaching? (Besides at MfA itself, of course, but there’s a lot of overlap, naturally!) I even had a problem when I had to submit a lesson plan, because so many lessons I’ve done this year either started with an idea from someone else’s blog or was improved by someone else. So what lesson plan can I really call mine? When I think about what type of mathematics teacher I want to be, I think about all of the wonderful mathematics teachers I communicate with regularly through Twitter. I proudly consider myself to be a member of the Math TwitterBlogosphere, or MTBoS. Every day I read the blogs and thoughts of a wide variety of teachers from across the country (and a handful of international ones). I take the ideas that I like, I give input of my own through comments and tweets. More than just passive reading, though, is the collaboration I take part in. I have my own blog where I reflect on things that I have done in my classroom. I can get feedback on the things that I do so I can improve them. On top of that, every summer I attend Twitter Math Camp. (In fact, since last year I have been on the planning committee for the conference.) At this conference, Iʼve hosted sessions on making interdisciplinary topics and making educational math games. Iʼve co-created lessons with these teachers that are then spread to others beyond the conference. Through this network I also often read many articles that can help improve myself as a teacher. Some of these articles are research – looking more deeply into how people learn mathematics. The blog of Christopher Danielson is usually very fruitful in this regard – digging down into number sense helps build a foundation that supports other mathematical learning. I also read articles pertaining to social justice issues – how race and gender have effects in both schools and the world at large, and steps I can take to make my classroom a safer place. Math for America itself also provides many of those contacts that help me improve. I often sign up for more than one PLT a month because I get so many good ideas out of them. I love having the opportunity to talk to other teachers about what they do. Teaching can often be an isolated experience, and just a window into another classroom can do a lot to improve someone. This year Iʼve also tried new things to bring myself closer to my ideal as a teacher. I implemented a new grading system that focuses on growth instead of a static level – this way, even a student who is far behind can feel like they are making a lot of progress, and pushes those students on the top for more, beyond what they already did to get to the top. I am also using a new Problem-based Learning Curriculum. Mastery of procedures is not sufficient for learning mathematics – they need to build habits of mind and problem solving skills. Having a PrBL curriculum helps me get at those skills and find new ways. Iʼm also often studying new math as well. Iʼm dating a PhD in math and I often have conversations about the new math he is studying or what he is teaching in his courses. We occasionally work out problems together that interest us, and that usually leads to a better understanding of topics I teach that I only thought I understood fully before. That sums up my overall strategy on how to continue growing: look to exemplars, find what I like about what they do, question myself about why I donʼt like things they do, so as to not allow myself to get complacent, and always keep pushing boundaries. 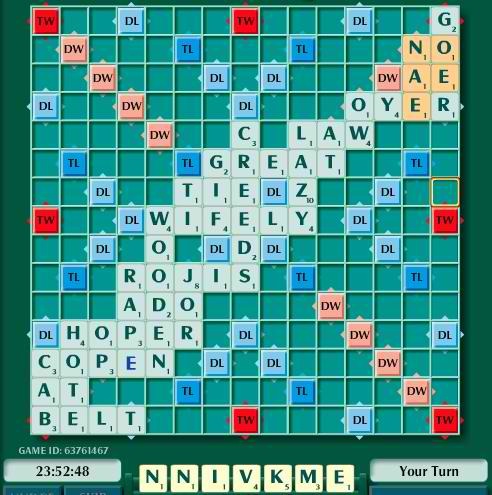 So I was playing Scrabble last night (I lost – it’s one of those board games I’m not the best at) when we talked about how, when you are playing with good competent players, the board often winds up with knots of small words close together. So we talked about how we could promote long and fun words instead of those same short words all the time, and thought you could have a variant where you get bonus points based on how long your word is, regardless of which letters you use or where you place it. Such a bonus somewhat already exists – you get a 50 point bonus if you use all 7 of your tiles. So we thought we could add other bonuses for other lengths. We agreed we should keep the 50 point bonus for 7, and that you shouldn’t get a bonus for only using 1 letter. As well, we thought a 2 tile go should get 1 point as a bonus. So I said I could definitely model it from there. I tried to feed those data points into Wolfram Alpha for a fit but they provided linear, logarithmic, and period fits, all of which were terrible. I then forced them on a quadratic fit (after all, 3 points make a parabola), which was alright, although maybe too many points for a 6 tile play. 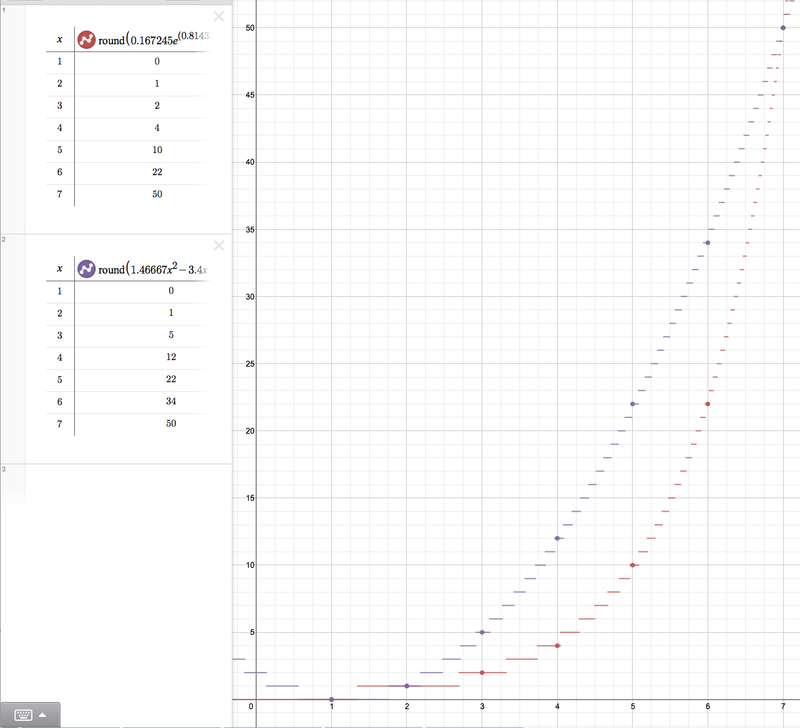 Then I did an exponential one (though I had to use (1,0.1) since Wolfram didn’t like using (1,0) in an exponential fit, as if we couldn’t shift the curve down.) Then I just fed them into Desmos and rounded. Below are the graphs and the tables for each fit. What do you think of this variant? Which point spread would be better? Of course, we’d have to play it to see….